What a wonderful place to spend the holidays! This year Devin & I flew to Banff for Christmas. 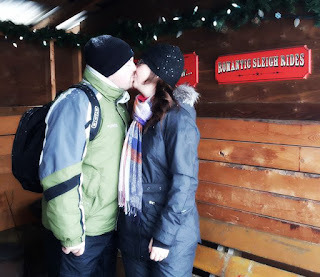 A number of factors came together to make it a reality: Cody was spending Christmas with his mom, Devin & I both had nearly a week off work without taking "vacation" time, we had wanted to do a delayed honeymoon at some point....so, the decision was made. We stayed at Buffalo Mountain Lodge just outside the city. It was exactly the feel we were going for. The lobby was totally decked out for Christmas with a roaring fire in the fireplace. We even had a fireplace in our room! This trip was the perfect blend of relaxation (puzzles and Christmas movies) and adventure (snowmobiling up a mountain). The views were so spectacular we felt that we were in a snowglobe! It was cold - I wore an insulating layer the entire time I was there - but gorgeous. The layer of snow on top of everything was breathtaking. One of the moments I had anticipated the most was the "one horse open sleigh" ride on Christmas Eve. I'm a real sap sometimes and the thought of doing this in the mountains on December 24th was just too much for me to handle! It did not disappoint. We climbed into our sleigh and were covered by a buffalo hide for warmth. We made our way through some open areas and even spotted a herd of elk. As the snow softly fell, I tried to take a mental snapshot that I could savour in years to come. What a unique experience! 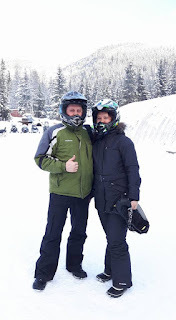 Another one of my favourite moments was our full day of snowmobiling in BC. Wow! What an adventure. It was amazing to wind our way up the mountain and see the fantastic views along the way. 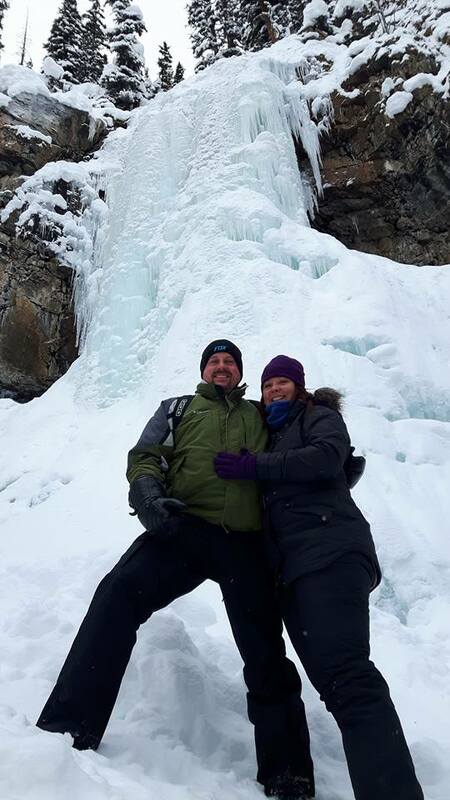 We stopped a few times at particularly breathtaking vantage points - including this frozen waterfall. At the top, we stopped for lunch at a cabin - giving us the opportunity to warm up. After lunch, it was time to rip around the "powder bowl". That was what Devin had been anticipating since we booked the trip :) However, when you're on the BACK of the snowmobile, it's much different. With each bump, my bum came right off the seat! I was really getting jostled around and thought I might just fly off the back and Devin would never know. So, I had a time out to take photos while he raced around like a maniac. We both returned home sick with a cold, but we had such a great time, it didn't seem to matter! What a great first Christmas as Mr. & Mrs.